British Airways, flag carrier and the largest airline in the United Kingdom based on fleet size has rolled out a Student fare campaign here in Nigeria. The campaign which begins in March 2017 offer students who desire to study overseas, access to promotional fares that enable their travel budgets to be managed efficiently. for return tickets to eligible students and youths who wish to pursue their academic ambitions in tertiary institutions in the diaspora. “It has become important to manage travel budgets in the times that we are in and that is why British Airways has introduced the Student fare especially to assist Parents that desire to continue giving their children or wards quality education.” He further expressed that, “the British Airways Student fare program will be convenient as it fits into the fixed academic schedule of Universities abroad, thus making it easy for British Airways to plan bookings made by the students”. To create awareness about the British Airways Student fare, the airline will be organising the British Airways Student Fair at the prestigious Eko Hotel and Suites in Lagos Nigeria. Parents and students from different secondary and tertiary intuitions will be invited to the event; where British Airways will furnish the participants with more details about the Student fare and also seek to answer questions that may arise. The event will also be opened to other students after they have provided valid student identification cards. The Student fare will be beneficial to secondary school students who will need to pursue their educational dreams but also to those who are willing to chase a post graduate degree abroad. Eligibility for the British Airways Students fare is that students must show proof of enrolment in a formal, higher educational institution in Nigeria or abroad. 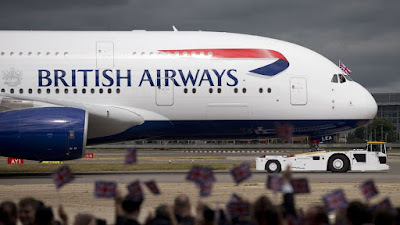 British Airways continues to appreciate their esteemed customers and will continue to offer unparalleled services that is suitable and advantageous to the Nigerian student community; BA Student Fare being a program that will assist greatly in managing travel budget for students seeking education possibilities abroad.